January | 2009 | PureBasic Team Blog ). The results for SortList() are not as good. Here the results vary depending on the list size, with a best of 55% but average of 71% for the 2 thread test and a best of 47% and average of 67% for the 4 thread version. Parallelizing a mergesort takes some more overhead than quicksort, as there is some waiting time involved until two smaller sort steps can be merged into a larger one. Since the larger sort steps come last and depend on the smaller ones (unlike with quicksort) this cannot be avoided. Also since a list is spread more through memory than an array, cache effects will play a role too. Still, both the results for SortList() and SortArray() are a good improvement in my opinion. How hard it is to write code that fully utilizes the CPU power can be seen on the parallel SortList(). I went through a number of different implementations for this command. 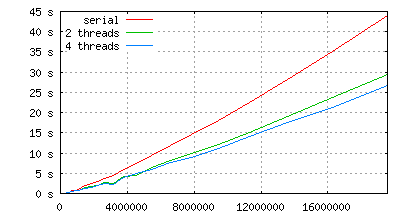 Trying to come up with more compact versions (which use less code or less memory reads/writes) only to find out that they performed worse than the original serial version due to cache effects. For example i found a mergesort code on the net witch uses only a handful of variables and a minimum amount of read operations. I implemented it in asm, using exclusively registers to store the variables. The instincts tell us that this is an optimal solution. But because of the way the code reads the list makes it read and overwrite values in the cache on every run. This makes it run slow as hell for large lists, even if executed on 4 cores. The key word here is “locality“. Memory locations which are close together must be processed together so that the values are still in the cache (or at least in many memory for large lists). The current implementation performs quite well in this respect. By the way, some of this locality optimisation is already present in the 4.30 release. One of the reason why i wrote the block allocator about which i talked in my first blog post was to make sure that list elements are closer together. This way both the sort, but also a normal walk through the list can be executed in a more cache-friendly way. The block allocation was working in time for 4.30, the parallel stuff did not make it to that release. This entry was posted in Libraries on January 4, 2009 by freak.